I carry some sort of camera with me at all times. Apart from the fact that I can pull a camera out and document interesting things I see at a moment’s notice, it also gives me a source of endless entertainment when I have small bits of time to kill. It’s hard to squeeze most work-related tasks into 15-25 minutes blocks of time, but it’s easy to grab my camera and snap a few photos! Recently I’m found wandering around campus in those little bits of time between activities, climbing into bushes and crawling around on the ground looking for interesting insects and plants to photograph. I’m sure people think I’m totally nuts, but I’m enjoying it! Today, I’m going to share 5 insect photos I’ve taken over the last few weeks. All of these were taken with my iPhone and the Photojojo macro lens attachment because it’s what I happen to have on me most days. I’ve come to realize that I like everything about fairy duster plants, from their beautiful tiny leaves arranged in neat little rows to the color of the fruits, but I especially love the Dr. Seuss style flowers. Apparently these ants found something really great inside these flowers because I watched this flower for a good 15 minutes and saw hundreds of ants climb up the bush, into the flower for a minute, then back out and down. This isn’t the best photo focus-wise, but I still kinda like it because it reminds me of the experience of watching the ants. A great way to pass some time! I think carrion beetles are fascinating, if disgusting, animals! They’re also stunning beetles. The fact that I pulled this beetle off a rotting raccoon when I collected it doesn’t diminish its good looks to me at all! 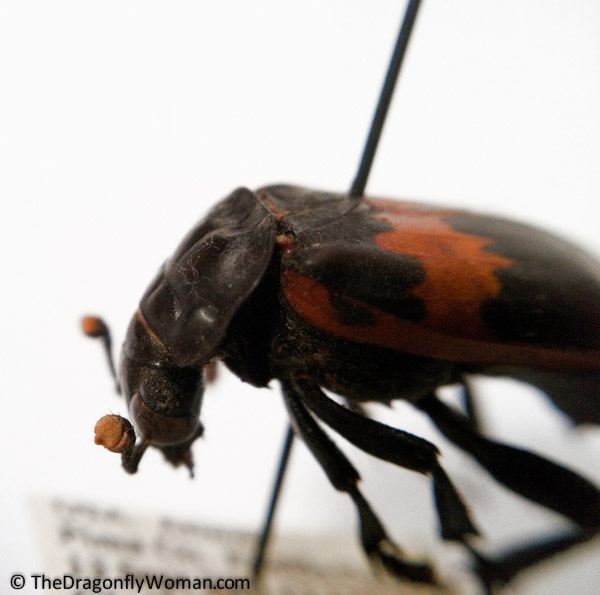 And did you know that one of the carrion beetles, Nicrophorus americanus, is actually on the endangered species list? I’m shocked, but happy, that an insect that makes “mouse balls” out of dead mice was actually deemed worthy of protection. I feel that’s a step in the right direction that might pave the way toward greater invertebrate conservation. If I drive down to the end of my street, I end up in a little parking lot that serves the trail that runs for miles along the “river” “flowing” through town (nevermind that on a good year it’s only got water in it about 14 days!). It’s a great place to take photos of the mountains, so I drive right past my house to that parking lot when the sky is looking particularly nice to shoot some photos. A few days ago I drove down there and saw the most magnificent naked acacia tree, one of the few trees in the area that lost its leaves for the winter. 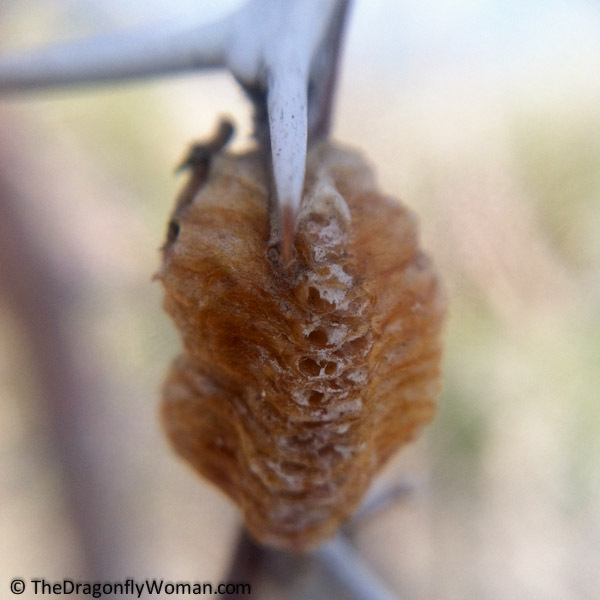 I was taking photos of the enormous spines when I found the egg case. I was so excited! I have no idea what will come out of it (well, that’s not entirely true: I know they will be mantids! ), but I brought the egg case home with me to hatch them out and see what they are. It’s now sitting in a little cage until the mantidlings hatch, at which point I’ll take some more photos and release most of them back into the wild. Might keep a few to observe them as they grow. If there’s one thing I’ve learned from this photo obsession I’ve developed (darn you BugShot! Now I spend all my free time and spare cash feeding my addiction…) it’s that there truly are insects everywhere! I’m learning a lot about insects by photographing them too. I’ve been trying to ID things whenever possible, so I’ve dramatically improved my identification skills, and I’m getting good at finding very tiny things. I’ve worked so little with terrestrial insects that I find it all fascinating and exciting. There’s something new around every corner, under every leaf, so I’ve become an explorer. I’m loving every minute! 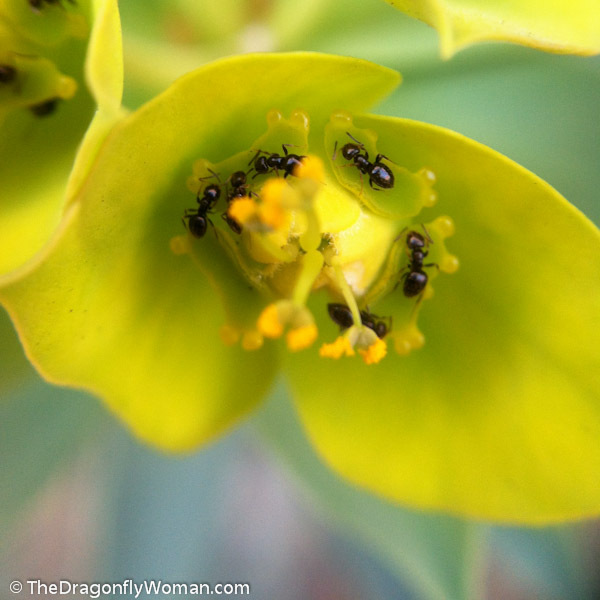 Love your photos, especially the comatose ants. I often say to the kids ‘I’m taking my camera for a walk, back later’ and trundle off to the backyard. We have half an acre that is mostly bush and, as you said, there is something new around every corner and under every leaf, tiny flowers, lichen, bugs. We only have stock fences so the neighbours can see me. They must wonder why on earth I am out there taking close-up photos of the ground so often! We are lucky to have such an interesting backyard and I really appreciate not having to make special trips to look for bugs. I recently got a new camera and we are still making friends so I appreciate it all the more now! Excellent post. Full of fascinating info as usual. EVERYONE should be made to observe bugs. I have no scientific training or expertise but love watching and photographing them. Thanks! And I agree – everyone should observe bugs! Don’t think it’s ever going to happen, but observing insects really opens up this whole new world to you and I think it makes you see the world around you in a different light. The would would probably be a different place if we all took a few minutes to appreciate an insect now and again. I love ants too. 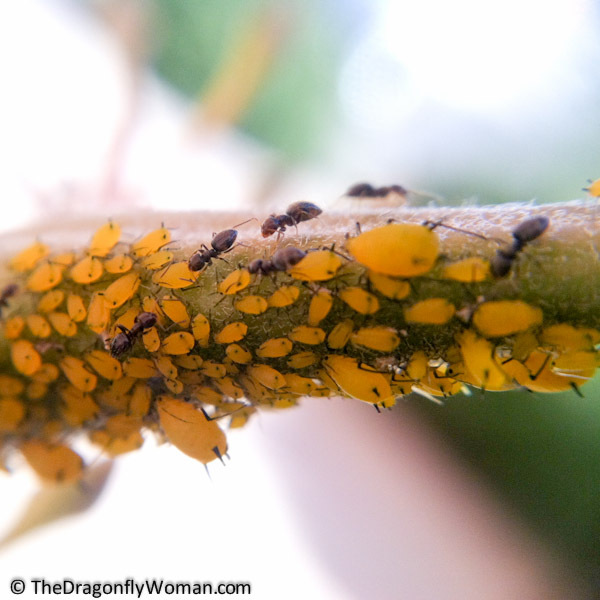 Several years ago I was weeding in my yard, when I noticed ant activity nearby. It was an ant war! Red ants and black ants were engaged in fierce battle right under my nose. 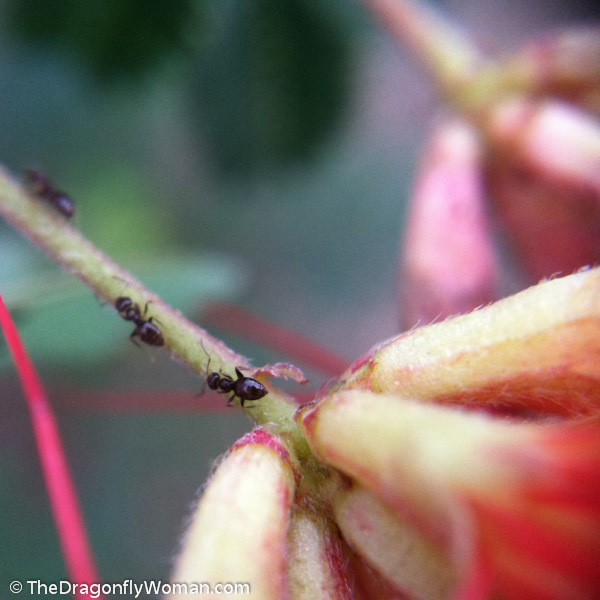 The black ants were twice as big as the reds, but the reds made up for it in feistiness. One pair of little fighters caught my eye, a black ant was dragging a maimed red ant away, and suddenly the red ant grabbed onto a blade of grass in a desperate attempt to free himself, but the black was too strong and pulled him loose. I tried to save him but they disappeared in the tall grass, thereby sealing his fate. Have you ever seen an ant war? It’s pretty amazing. I remember reading in Walden Pond, where Thoreau had the same experience of watching ants do battle. Yes, I love ants. Nice! I’ve never seen an ant war, though I hope to do so sometime. They sound pretty epic! Your insect photos are so fascinating. I’m often finding fabulous critters and am kicking myself for not having a camera with me, this is just another incentive to (finally) upgrading to a smartphone with s decent camera. If you do upgrade to a smart phone, I recommend getting the Photojojo macro/wide angle lens to go with it! It will really extend the capabilities of your phone’s camera and let you take photos of small things. It’s kinda crazy how good cell phone cameras are these days too! My first digital camera, which was considered one of the best at the time, had a much lower megapixel rating than my iPhone camera! It did better macro because it had better lenses and a bigger sensor, but for landscapes my phone is actually better.